I made soy stew two nights ago, because I wanted to bring it to the office for lunch; my colleague Andrea has just taken the big step from being a vegetarian to becoming vegan, and never knows what to eat for lunch, so I thought that soy stew could be a great “schiscetta”, or box lunch, as we say here in Milan, for both of us. I made the stew with little conviction, and was prepared for it to be a flop, because, believe me, raw dehydrated soy stew is not exactly aesthetically pleasing (it looks like dog food!). However, when I open the Tupperware container at the office, my colleagues were all attracted by the wonderful aroma of the dish, and couldn’t wait to taste the weird food we vegetarians eat. Take the dehydrated soy nuggets, be brave and put them in a bowl of warm water; soak for 30 minutes. In those 30 minutes, forcing yourself not to think that soy seems like dog food, begin to prepare the sauce for the stew. Put the onion, garlic, and olive oil in a non-stick pan, and sauté (if you have carrots, and celery at home, they make a great addition). When the onion has softened, remove the garlic, and add the tomato, the potatoes cut small, plenty of rosemary, a pinch of salt, and a cup of water. After the indicated time, take the soy nuggets, squeeze them, and put them in the pan with the sauce, adding more rosemary. Rosemary is what will save the dish, so don’t worry about how much you use, use it abundantly, particularly if you have powdered rosemary. There are those who say that at this point, it would be enough to stir to consider the mission accomplished, but I believe that soy nuggets should cook quite a bit in the sauce to taste acceptable. Pour a little water in the pot every so often, so the sauce doesn’t dry out too much, and cook the soy nuggets at least half an hour. 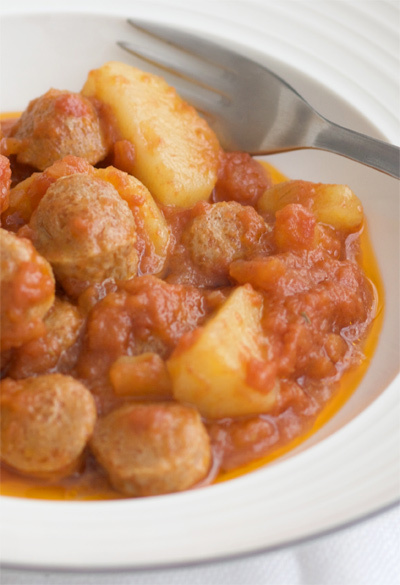 When the potatoes are perfectly tender, and the soy stew has absorbed a little sauce, adjust the salt if needed, and serve immediately, perhaps with a handful of rice, or bread on the side. We are Benedetta Jasmine Guetta and Manuel Kanah and we've been running this website since 2009. We specialize in Kosher and Jewish recipes, from Italy and beyond, but we enjoy cooking all sorts of things: we love vegetarian food, we never say no to pasta, we have a soft spot for chocolate and caramel... there is so much to choose from!